Combine Hickory Balsamic Vinegar and maple syrup and set aside. Rub pork chops with seasoning and sprinkle with smoked salt. 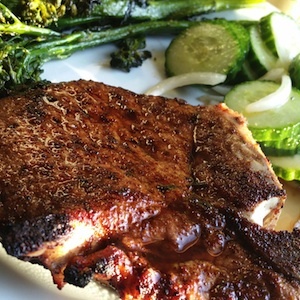 In a hot skillet or cast iron pan brown chops in EVOO just until golden on both sides. Place on a roasting pan. Brush chops with the mixture of balsamic and maple syrup and broil about 3-4 minutes per side depending on size and thickness of chops. To serve add an extra drizzle of Hickory Barbeque Balsamic Vinegar….enjoy!